Already know Python but want to learn more? A lot more? Dive into a variety of topics used in practice for real-world applications. Covers regular expressions, Internet/network programming, GUIs, SQL/databases/ORMs, threading, and Web development. Learn about contemporary development trends such as Google+, Twitter, MongoDB, OAuth, Python 3 migration, and Java/Jython. Presents brand new material on Django, Google App Engine, CSV/JSON/XML, and Microsoft Office. Includes Python 2 and 3 code samples to get you started right away! Provides code snippets, interactive examples, and practical exercises to help build your Python skills. Python is an agile, robust, and expressive programming language that continues to build momentum. It combines the power of compiled languages with the simplicity and rapid development of scripting languages. 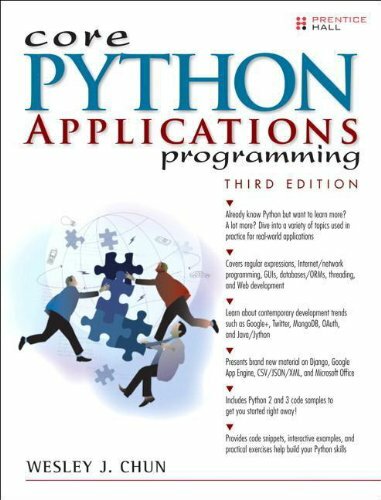 In Core Python Applications Programming, Third Edition , leading Python developer and corporate trainer Wesley Chun helps you take your Python knowledge to the next level. This book has everything you need to become a versatile Python developer. You will be introduced to multiple areas of application development and gain knowledge that can be immediately applied to projects, and you will find code samples in both Python 2 and 3, including migration tips if that’s on your roadmap too. Some snippets will even run unmodified on 2.x or 3.x.